Okay, the graduate school thesis story. No one was surprised when Danielle and I announced we wanted to write our thesis together, as a two-woman production. We were, after all, inseparable. Besides that, we both saw many great benefits in making our theses a joint project: 1) only half, as opposed to total, responsibility for the colossal failure in a final project which was to represent the culmination of two years spent in toil, therapy, bottomless Little Debbie family-size boxes, stark, crumbling practice rooms with no actual pianos in them, bathrooms puking, voice lessons venting, dance classes ditched, fire alleyway chain-smoking, etc., etc; 2) well…actually, only half-ownership of failing was the biggest thing. Personally, I had extra incentive to go in with Danielle on the project. I mentioned in the first installment, Danielle is a phenomenal belter. Her rendition of “When You’re Good to Mama” is something to be chronicled under your “Holy Crap, She Sang That Song and Now I Don’t Remember Where I Live” cabinet. Hitching my wagon to her star would gain me points nary obtained by flying solo. In my eyes, it was (and will always be) a very favorable venture to work with D. So off we went in search of a good thesis idea. The performance itself had to be a 50-75 minute original production, consisting of at least 12 songs, with a well-outlined, well-illustrated thesis statement. It could be a production derived out of a book or play, it could be based on a person, or it could be in the form of an original lecture presentation. Danielle and I chose original lecture presentation. We named our show “Elements and Archetypes,” which sounds very, very smart, doesn’t it? We wanted to explore female archetypes in musical theater and how these archetypes are assigned to certain vocal types - - either to a soprano or alto. Research involved first studying some of the original female archetypes in literature, music and art, and then finding characters in musicals which exemplified these archetypes (Laurie, from Oklahoma; Adelaide from Guys and Dolls, etc.) Then we went back and followed the history of musical theater, from its early beginnings down to present day. We noted that as musical theater evolved over time, archetypes were converging, more female characters were a combination of two or more types. With the blending of traits in these female roles came also a blend in vocal type and style - - in other words, women in modern musicals more often sang songs using both high and low ranges, both strong and soft dynamics (Aldonza/Dulcinea, from Man of La Mancha, Evita, etc.) She wasn’t just a soprano, she wasn’t just an alto. She was both and everything in between. In terms of format, this is what we came up with. Danielle and I would address the audience as ourselves, we’d introduce an archetype (we used only four), tell the audience a little bit about her, then retreat into a scene/song segment, taken from a musical which best illustrated that archetype. The show would conclude with the introduction of a “new” archetype: the All In One. And we wrote a song about her, and that would basically be it. It’s great that I can sum up our thesis project in a few short paragraphs now. Creating the show, wading through tons of research, selecting the right archetypes, picking the songs, constructing the script, it was all unbelievably difficult then. Not only did it have to work, it had to make sense, and our thesis, Hello! It had to be entertaining. It couldn't drag, and we couldn't lose our audience in too much rhetoric. We wanted to sing about things that matter, songs people would enjoy listening to, not just songs that illustrated our point. Finally, there had to be a story arc, a beginning – middle- and end feeling to the overall show. Not so easy when you’ve chosen a lecture presentation format. They needed to laugh, they needed to cry. Blah blah…yadda yadda. Have you got the picture? IT WAS HARD. So there were deadlines for turning in certain things along the way. The first thing you turned in was your proposal, then an outline, then a revised outline (I think). Then you performed a first draft for your colleagues and certain members of the faculty, for feedback purposes. Lastly of course, you submitted the final performance. You were to meet with your advisor regularly for guidance. And as any graduate student can tell you, getting a good advisor over a deadbeat is like the difference between getting a cavity filled with anesthetic or without. Either way the cavity is filled, but how many years off your life did it end up taking? The general rule was, by the time you got to your first draft run of the show, your thesis was about 90% ready to go. Fortunately, our thesis advisor was great. Unfortunately, no one else on the faculty agreed with the advice she gave us. Just one month prior to our final performance, we performed the first draft. It was a nightmare, total and complete. The song choices were unvaried and uninteresting, the script needed all kinds of revision, the archetype explanations were too dense. You name it, they abhorred it. I distinctly remember two faculty members arguing for five minutes about my use of the word “purveyor” in the script. Frankly, even I thought the show was boring and lifeless. After the feedback session, Danielle and I were left with no choice but to start over. One month to write a whole new show. We were panicked. I think we threw out all but one or two of the original songs, we slashed and hacked out a tighter script, we slowed the archetype sections down so that people could follow, we added light cues so the audience would know when we were playing a role and when we were playing ourselves. I have to admit, the show we ended up constructing in one month was far and away a much better show. They were right. And Danielle and I were pretty proud of the end result. We had great friends, and lots of them. Both nights were full houses, and the energy and love emanating from them was truly what made our thesis fly. My parents came to town. Danielle’s parents came to town. My bishop and his wife came, my home teachers came, other church peeps came. They laughed in all the right places, they cheered us on. It was indescribable. I remember Neil, the department chair, giving me the best compliment after he saw it: “Mary,” he said “I just love to hear you sing.” Do you know how many people in the world this man has heard sing? A lot. A lot. Three weeks later, I crossed a stage wearing a black tent and hugged Neil again - - this time, as a graduate. I was gradutatiated. And I’ve been told that even today, certain battle-axe faculty members refer their graduate students to Danielle’s and my thesis as an example of a “good” thesis. I wonder if they bother to mention how they convinced us it was total bunk, even with all the revisions. Still, a great feeling of validation, that. I feel purged. Most cathartic. I think I can close the book now. ps. D, I had so much fun with you. You kept me safe. You made me laugh so much. Thank you. You are my shining stah. Miss you. Um...this is all I have to say. This is awesome. The poem isn't half-bad either. Pardon the pun. I know I’ve been promising a final chapter in the grad school saga. But frankly I’m still recuperating from the mental shredding it took to write the first two. I promise you, once my last therapy bill has cleared, and after an adequate subsiding of the involuntary twitching and routine night sweats, I’ll get right on that. Meanwhile, let me tell you another story. Ready? M’kay. Last week, I was home in California. The trip was for practical purposes, and practical purposes only. I was there to spend some much-needed time with the family, help Mom with stuff around the house, basically lay low and keep it simple. This is Clovis, CA people, what other options are there? For there is the dwelling place of raisins, heat, high school football freaks, strip malls, slow drivers, and stucco housing developments stretching as far as the toxic, contract-acute-asthma-within-hours, valley sky will allow you to see. Okay, that means you can see only a block ahead, but trust me, there’s like a billion cookie-cutter houses past that big hazy cloud you’re looking at across the street. Imagine a place that is completely devoid of mystery, charm, excitement or adventure, and you’ve beheld the vision of Clovis. This was not – I repeat – not a trip designed for romance, thrill-seeking, cradle-robbing, boy prowling, or in other words, attending my sister’s barely not even children anymore singles ward and meeting a 22 year-old returned missionary, who takes me out on a date last Friday night because the poor boy could not even help himself in my presence. This was not supposed to happen. But happen it did. Yes. I still got it. You guys, I totally met him after Sacrament meeting. He gave me the "you look really familiar" line. He then asked me how old I was, because he suspected I used to hang out with one of his sisters. Oh my gosh, I was so happy he asked me how old I was. I was giddy to tell him, because I couldn't wait to see the response. "Thirty-two!" I said with a huge smile. Oh, his face...oh, his cute little face. "Okay, then that can't be it," he said. I was centimeters from firing back with, "well, maybe I babysat you when you were nine or something." I resisted. This is the shocker though. He later asked my sister if I was single. He totally got my number from my sister, and he totally called me you guys. We had Cold Stone. We walked around. It was like amazing. I think I can still hear my father’s laugh all the way from Boston. Maybe someday I’ll tell you about the time I went on a date with a 62 year-old. (But today unfortunately is not that day.) From 62 to 22. A 40 year spread. Very open-minded, I must say. Basically, if you are legal and/or can still feed yourself, gimme a call. I’m your Friday night gal. I don't usually advertise this, but I am a total girl. I know, pick up your lower jaw. No, what I mean is I love the girly. I'm a little embarrassed by how much. So this post is a confession, complete with evidentiary photos. I'll start with what I did last Sunday afternoon. 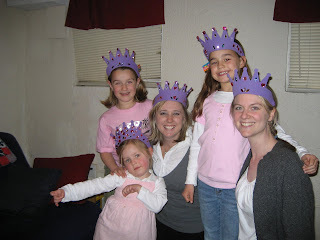 Peggy and I went over and had a princess party with our bishop's kids and his wife. Such a blast. We've done these before. We have a light luncheon, served by Sir Bob (aka Jackson, older brother) followed by dancing with wild abandon, not caring who we flash with our princess underwear. 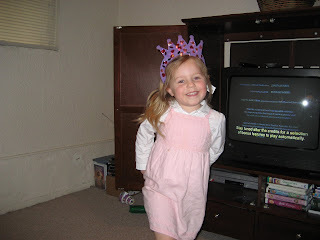 Then, we move to the downstairs to watch Cinderella III and make bejeweled tiaras with elmer's glue and foam. You guys have to see Cinderella III. I'll let you borrow my copy. It's intense. 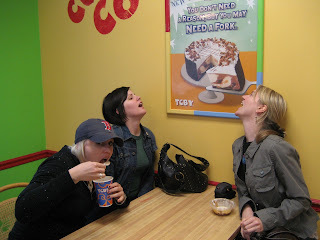 We eat ice cream sandwiches and sing the Cinderella song following the movie. Then of course, there's the pedicures. It's pedicure season. So we girls head to Belmont Center and have a total girly day. We hit TCBY, where Mary mows a turtle sundae with extra bananas in three minutes. Clearly from this photo, it wasn't enough. I'm a girl. That's right. You wanna go?! Roll up, I will take you. And if you mess up my pedi, you are toast. Finally, you guys MUST click this link. It's a standup routine about going to the nail salon, and it is DEAD ON.